Movies like The Godfather have tended to make life in the Mafia seem glamorous, Shakespearean and operatic. Heck, it’s so appealing that at times it seems like the Mafioso is the best Italian export since pasta. 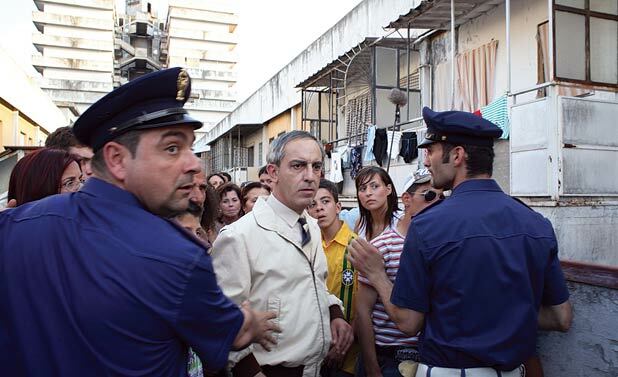 Now it’s time for the more mundane truth to emerge in director Matteo Garrone’s intriguing account of the Napoli-based Camorra, adapted from the bestselling book of the same name by journalist Roberto Saviano, who now lives in hiding because of his work. This excellent ensemble drama does for crime families what Syriana did for the oil industry. Garrone shows us various facets of Mafia life, from the recruiting of young kids to the infiltration of seemingly legitimate industries such as haute couture and segues into the waste management. The documentary aesthetic, multi-layered storytelling and nihilism ensures that the action is satisfyingly disorientating, most obviously at the beginning of the film when it’s difficult to work out who’s who or attune to the different strands of the five rambunctious stories. But what is important, and highlighted by the poignant symbolic and poetic images, is that the Camorra have soiled their hands. Not to say that the traditions of the Mafia melodrama have been completely lost, as loyalty, blood ties and personal ambition are prominent. GFT, Glasgow and selected release from Fri 10 Oct.